AccuWeather-(ENEWSPF)- Residents enduring the brutal and deadly Arctic outbreak to end January can look ahead to the March-like weather that awaits during the first weekend of February. 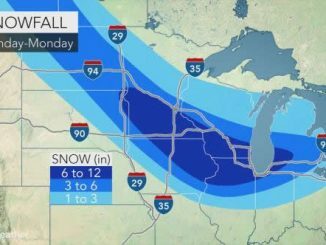 The departure of the polar vortex will open the door for milder air to surge in, first across the Midwest on Saturday and then the East Sunday through Monday. 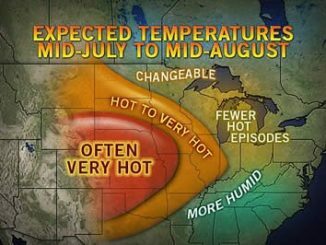 For many, especially those across the northern tier, the upcoming warmup will be nothing short of dramatic. “The mercury will go from record lows in the 20s below zero during the middle of this week in Chicago to about 40 above zero by the end of the weekend, a swing of about 60 degrees,” according to AccuWeather Meteorologist Bill Deger. It will feel even warmer, considering how extremely low AccuWeather RealFeel® Temperatures are plummeting this week. 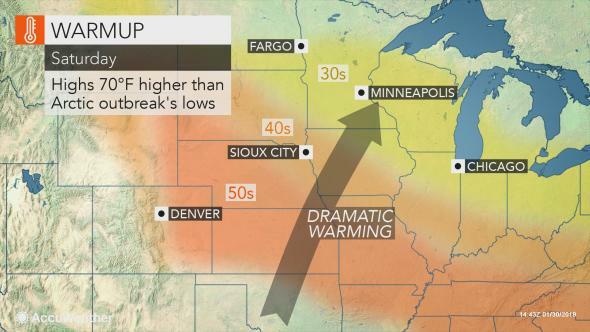 After enduring RealFeel® Temperatures around 60 below zero on Tuesday night, residents of Minneapolis will definitely enjoy highs near 40 on Saturday. Even if RealFeel® Temperatures are held closer to freezing to start the weekend, many are likely not to be disappointed. Sunday and Monday may feel more like March days from Atlanta to Chicago, Detroit, Pittsburgh, New York City and Boston. “Temperatures will be pushed to the 50s in places like Pittsburgh and New York City early next week after being in the single digits and above zero later this week,” Deger said. Next week can also start with temperatures climbing to around 60 in places as far north as St. Louis, as well as Cincinnati, Ohio, and Richmond, Virginia. The mercury may climb close to 80 in Jackson, Mississippi, and make the snowflakes that fell on Tuesday morning a distant memory. The warmth may attempt to spread across northern New England early next week, but snow covering the ground may limit how much temperatures rise. Any rebound in temperatures across the northern Plains this weekend may also be brief as colder air quickly returns, though not to the degree as this week’s Arctic blast. Rain, drizzle and/or fog may also try to put a damper on the warmup in some communities. Since roads and sidewalks can stay colder a little longer than the air temperature after an Arctic outbreak, there can be a brief period of freezing drizzle along the leading edge of the milder air in the Midwest and eastern Great Lakes this weekend. 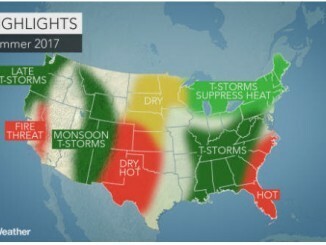 “The sudden warmup could lead to ice jam flooding on some rivers and the Midwest and mid-Atlantic next week and beyond as large chunks of ice break loose and jam the flow of water downstream,” Deger said. Residents of southern New England also have to remain vigilant of this danger. “Such flooding can be sudden and lead to bridge closures and travel delays,” Deger added. More potholes may be unearthed as temperatures rebound. The warmup, however, will have many happy to catch a break from higher heating costs. Animals and kids cooped up during the Arctic blast to avoid frostbite and hypothermia should be able to enjoy more time outdoors. Parents will not have to worry about schools closing or delaying due to the extreme cold. Despite the turn to milder weather, winter is not over yet. 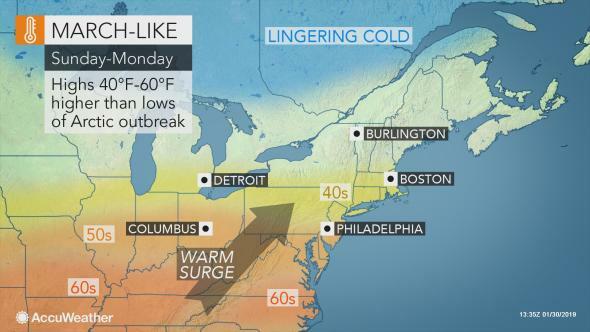 “There is still plenty of time for more low-level cold events leading to snow and ice and holding back temperatures, especially in the Northeast and Midwest,” according to AccuWeather Lead Long-Range Meteorologist Paul Pastelok. More typical cold can return to the Northeast and mid-Atlantic during the second week of February, according to Pastelok. While that can be followed by another brief warmup, additional Arctic shots can follow later in the month. “Any cold for the rest of winter may not be as extreme, especially for the Plains and Midwest,” he stated.